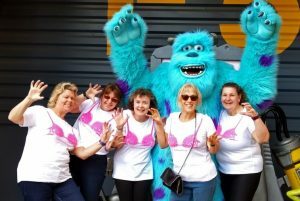 A KNAPHILL woman has power-walked nearly 20 miles in two days through Disneyland Paris in her latest fundraising effort for the Woking-based breast cancer charity Walk the Walk. Sarah Gill has taken part in several events to help the charity and is now preparing to do a full 26-mile marathon length cross-country skiing event in the Subarctic circle of Swedish Lapland in March next year. Sarah, 53, who grew up in Woodham and has lived in Knaphill for the past 20 years, completed the 31km Bibbidi Bobbidi Boo challenge with a 12-strong Walk the Walk team, receiving three Disney-themed medals one each for the 10km walk on the Saturday and the half marathon walk on the Sunday and another for completing both distances. “I have done a few challenges now and the Disneyland Paris Challenge was high on my list, so I signed up,” Sarah said.